a Cyrillic character set or a soldered connector. 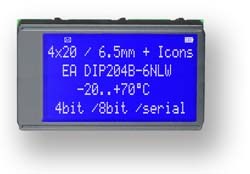 The dot-matrix LCDs offered here are all equipped with the HD 44780 controller or similar; they contain a complete character set and are configured for operation on the 4- or 8-bit data bus of a processor system. There are R/W, RS and enable control lines. Please ask about special models with an extended temperature range, a "#FF0000">Cyrillic character set or a soldered connector. Semi-customized solutions are possible as of 250 units. 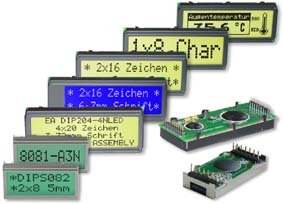 The accessories we supply for dot-matrix LCDs include suitable bezels, RS-232 interfaces and inverters for displays illuminated by means of EL foils. Prices if you order in hundreds are between EUR 5.75 and EUR 192.76*) per unit (plus sales tax, if applicable, and shipping costs). We have a large stock and can thus deliver many models immediately from our warehouse in Gilching near Munich. You can download the complete dot-matrix 1x8 data sheet in PDF format here. You can download the complete dot-matrix 1x16 data sheet in PDF format here. You can download the complete dot-matrix 1x20 data sheet in PDF format here. You can download the complete dot-matrix 2x8 data sheet in PDF format. You can download the complete dot-matrix 2x12 data sheet in PDF format. EA T162G-3NLED 3.2 53.0 x 20.0 x 8.5 36.0 x 10.0 Flexible cable --- LPIPE, KF-16G req. You can download the complete dot-matrix 2x16 data sheet in PDF format. You can download the complete dot-matrix 2x20 data sheet in PDF format. You can download the complete dot-matrix 2x24 data sheet in PDF format here. You can download the complete dot-matrix 2x40 data sheet in PDF format. You can download the complete data sheet in PDF format. You can download the complete EA C124-NLED data sheet in PDF format. You can download the complete dot-matrix 4x16 data sheet in PDF format here. You can download the complete dot-matrix 4x20 data sheet (except EA P204-3N /-4N) in PDF format. You can download the complete dot-matrix 4x40 data sheet in PDF format here. 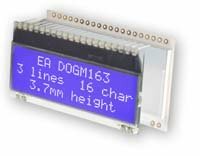 The EA 9707-V24S interface allows dot-matrix LCDs to be programmed easily and quickly. 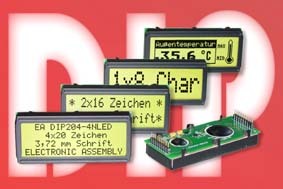 The interface can be soldered directly onto almost all dot-matrix modules. It is connected to a standard RS-232C interface. The data transmission rate can be set to 300, 1200, 2400 or 9600 bps. Umlauts (ä, ö, ü, ß, Ä, Ö, Ü) are interpreted as extended IBM code and recoded. If the display is full, it scrolls upward automatically. CR ($0D,13d) and LF ($0A,10d) are identified and executed. This automatic function can be switched off for individual cursor positioning. The supply voltage is +5V/typ. 1mA. The interface can also be supplied with an RS-422 interface (EA 9707 OPT-RS-422). The EA 9707-V24S can be connected directly to the 9-pin subminiature D connector of a PC, for example, via the EA KV24-9B cable (approx. 1.50m). information in our data sheet, which is available in PDF format. 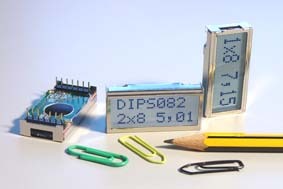 Bezels with an anti-glare screen are available for some graphics displays. The bezels are simply inserted into the opening in the front panel. This gives your unit a professional look, and at the same time the anti-glare screen prevents the integrated display from being touched or getting dirty. The anti-glare screen makes the display considerably easier to read. Please refer to the tables above for the order numbers of the various bezels. You will find more information on bezels in our data sheet, which is available in PDF format, or on our accessories page. In contrast to LED illumination, EL foil illumination require a series-connected electronic circuit. This electronic circuit, which is known as an EL inverter, generates alternating voltage of around 100V from +5V DC. These EL inverters have 3-5 pins that are soldered into a printed circuit board. The type required depends on the illumination surface. You will find more information on our accessories page, our news page or in our data sheet in PDF format.